Food halls have become enormous tourist attractions. 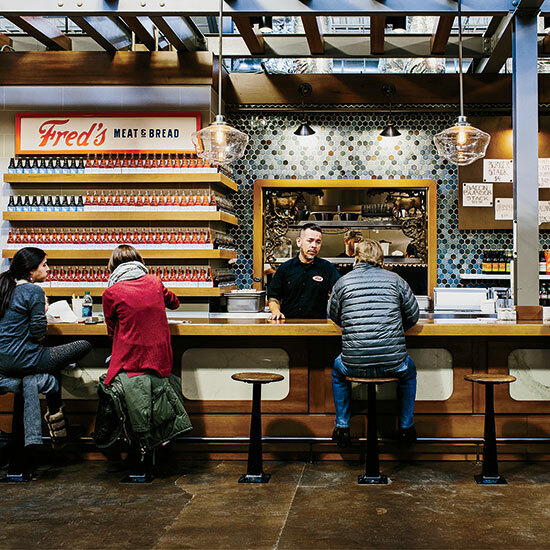 Here’s a look at the trend in the U.S.
Now, the food-hall–as–tourist-attraction phenomenon is spreading across the country. Eataly has expanded to Chicago, and cities like San Antonio and Santa Barbara, California, are launching ambitious markets with stalls from notable chefs and stellar artisans who make cured meats, chocolate and just about everything else. One place taking the food-hub trend very seriously is Atlanta. It’s a big city where things tend to be supersize (it’s got one of the world’s largest airports and hugest aquariums). Accordingly, its two new food halls, Krog Street Market and Ponce City Market, are enormous. Still, they have more in common than size: Both show off the city’s culinary evolution with dining areas that spotlight revered local chefs as well as rising stars, and each has inspired Mexican food stalls as well as artisanal ice cream stands. They also go head-to-head on sandwiches. At Krog Street, Todd Ginsberg of Fred’s Meat & Bread packs his Italian grinder with layers of meat and cheese and a dollop of aioli. At Ponce City, opening this summer, F&W Best New Chef Anne Quatrano will make fish-shack-style sandwiches like tarragon-flecked lobster rolls. Here, a look at new and soon-to-open markets all across the US. Some celebrate a single cuisine; others offer a round-the-clock multicultural experience with places for breakfast, lunch, dinner and drinks, plus hotels for crashing. With only independent shops and food stalls with communal seating, Krog Street has a neighborhood vibe. The emphasis on local businesses and the “old-bones” building attracted chef Eli Kirshtein to the project. “Nothing about it is cookie-cutter,” he says. 99 Krog St.; krogstreetmarket.com. Take a photo tour through Atlanta's Krog Street Market. In keeping with the theme of the building’s original tenant, Sears, Roebuck & Co., Ponce will sell something for everyone when it opens this summer. There are restaurants, shops offering items that range from cookware to antique lighting, and even rotating art installations. 675 Ponce de Leon Ave. NE; poncecitymarket.com. Take a photo tour through Atlanta's Ponce City Market. The Nutella bar introduced at this new outpost of the Italian-market empire serves the spread on everything from crêpes to brioche. eataly.com. The legendary Cecilia Chiang consulted on this AvroKO-designed market. chinalivesf.com. A chocolate mousse bar and rotisserie chicken await Francophiles at this Gallic market. ledistrict.com. Anthony Bourdain’s fans can travel with him (minus the malaria pills) at Bourdain Market. It’s due to open in NYC later this year with dozens of international food stalls. Stop by Stoic & Genuine’s raw bar, featuring granita flavors (like lychee-sake) created to pair well with unionstationindenver.com. Visit Local Coffee, which recently started roasting its own beans under the label Merit Roasting Co. atpearl.com.